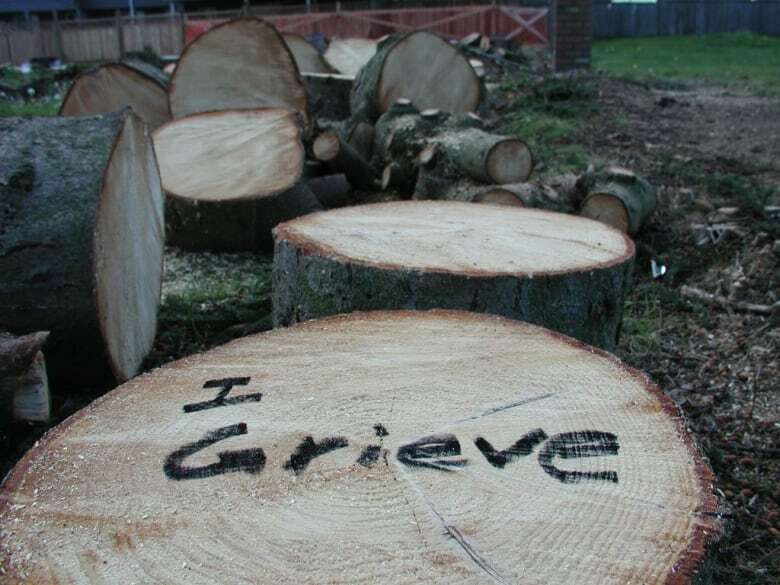 A collaborative art project called I Grieve takes aim at clear cutting trees in Surrey, and it is taking off online. A collaborative art project called 'I Grieve that protests clearcutting in Surrey is taking off online. 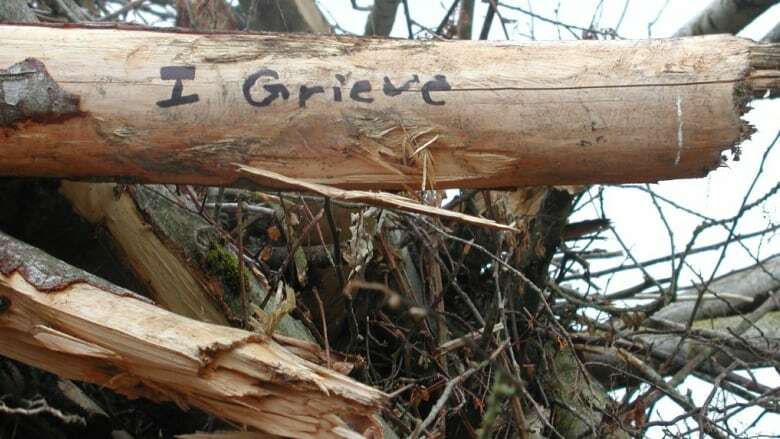 Dozens of people have written the words 'I Grieve' on logs and stumps found in clear cut areas throughout the city. The artist then anonymously sends a picture of their work and a message to the creator of the project, Dave Dalley. Dalley was inspired when a wooded area near his home in Newton was cut down. "I took a little black marker and I went down to a stump and I wrote 'I Grieve' on the stump," he said. "The idea sort of took off from there and now it's much broader than that. We put it out to the community so they could respond to habitat destruction in their local neighbourhood." The idea struck a chord with Sybil Rowe, who has been fighting to protect trees in South Surrey for decades. "Everybody loves trees, but they don't know it until they're gone," she said. "All of a sudden, when the clearcutting starts, they look around and say what happened? This place used to be beautiful and it isn't anymore." About a thousand people move to Surrey every month, creating huge demand for housing. The city tries to balance the need for development with the need for green space, said Surrey's manager of parks, Owen Croy. "We have planted in the last 10 years 179,000 trees through the Parks Division," he said. "In addition to that, when the development community comes in and wants to clear land for a subdivision, they are, in general, to replant a replacement tree for every tree that is taken out." Croy says the city is also committed to acquiring more park land. Mayor Linda Hepner said in her state of the city address earlier this year that she is undertaking the most aggressive tree planting program in the city's history. Dalley says he created the project to help the community come together and grieve with one another, not to pick a fight with the city. "This is not a protest," he said. "We are not blaming anybody or finger pointing. This is a conversation that we all need to play a part in and it's open for anyone to contribute."